Gary Farmer & the Troublemakers are on their Rezified Spring Tour promoting their new album Under the Water Tower. 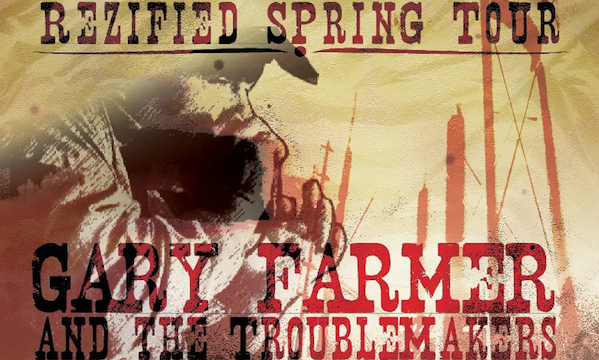 I caught up with Gary Farmer while he was preparing to go on the Rezified Spring Tour with the rest of the Troublemakers. Gary Farmer: I was born on the Six Nations rez along the Grand River. There are probably 22,000 people there now. It’s a big rez. I was born there but rushed off to Texas because my father was in the American army for a couple of years. That’s probably why I am in New Mexico now. I grew up in the United States, in Niagara Falls and Buffalo, New York. I broke free from the urban life of Buffalo where it was pretty gang style. It was a different economic time in the 50s and the 60s. There was the absolute insane values that arose during the industrial revolution. There was more seeming prosperity with jobs. It was kind of a hay day. As well it was probably the farthest our people have gone from who they are. Where as my generation has spent our time coming back. I went to university for a few years to become a cop but then the Attica prison riots happened in ’71. I was there so that changed my career path. I moved back to my rez after my third year in university. My parents came home the year before and we moved into a small general store right in the heart of Six Nations. I came home and pumped gas for my parents. That’s how I got to know my community. Of course I’ve got lots of family there. And when I’m away from home I try to get back for ceremony time. Marika Swan: What did you want to achieve when you were studying to be a cop? GF: I hate to say this but I was the oldest child in a relatively dysfunctional family and I wanted to help but I didn’t know how. When I was in the gang, I was the strongest and the biggest and probably had the most compassion, I suspect. I was not the only Native American amongst mostly the Italian, Irish, and Polish. Most of the people go from the illegitimate gang to the legitimate gang. I don’t know if that’s true in Canada but it is in the United States, especially in Buffalo, New York; the legitimate gang is the cops. When I saw that there was so much corruption within the system and that I would have to conform, I couldn’t change the system for the better. This was a big realization for me in 2nd and 3rd Year University. I had to find other means to survive or to express myself. By the time I turned 20, I knew I wanted to be an artist and I had already discovered photography during my last year of high school. In 1974 I moved to Toronto and went to Ryerson University while driving a cab and bouncing on the weekends at the Silver Dollar Hotel. Toronto is where I met James Buller, through ANDPVA, who is the man who changed my life. MS: When did music become a larger part of your life? GF: We had bands within our gangs and I was the organizer. I was the one who put on the gig for the band to play. They used to get us this big church hall and we’d have these big parties where you could get in for 2 or 3 bucks and there were live dances and it was a hit. Everybody was there. That’s the environment I grew up in. It was very nurturing in a way but it was dark too. Even though we used to say that we were lovers not fighters, you had to fight for your life as a child and a teenager so music came from that in a way. I was always the actor but I was always the producer too. I made things happen. I always played harmonica from when I left Buffalo, I took a harmonica with me to university. We all worked at the bar so we controlled the Beer Blasts at the bar. I used to get up and harp to other people’s music. I used to force myself on stage to play Blues harp because I was self taught and I got better. It wasn’t until I formed my own band that I started singing. MS: Tell us about the upcoming tour. GF: First off, I have some great players. My all time bass player Johnny Ringo is with me. He’s probably been with me six years and my cousin Bruce Fraser is coming from Six Nations to drum for me for the first time. I am sure you know the music of Brock Stonefish and his abilities, if not you should check him out. Every time I go on the road like this, I like to take players that can carry their own, right? They are singer-songwriters; they can perform their own material. We got a brand new guitar player with us, Lonnie Arellano. He’s a very talented songwriter as well. I just got a booking today in Lame Deer, Montana, which is one of my favorite places to bill because it’s the home of Pow Wow Highway in a way, that’s where those two guys were from and I lived there for a period while making the film. I got really into the Northern Cheyenne culture there because it was a big part of the movie. So going back there is so special for me. We are doing guitar workshops at the Chief Dull Knife College and that’s just perfect. That’s the kind of gig we want. That’s why we call it ‘Rezified’ because its mostly Indian communities we are going to, sometimes sponsored by the Indian social club or sometimes sponsored by independent artists in the city. It’s just beautiful, we are playing a lot of Indian casinos. 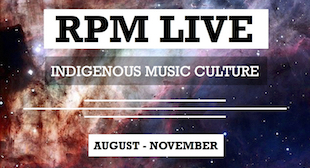 Some are being sponsored by rez radio stations or regular radio stations. We are playing a number of Blues clubs and a lot universities and tribal colleges so I do theatre workshops in the afternoon and we play at night. We are doing double-hitting in order to sustain the tour. It’s an Indian band going to Indian communities. It’s working and people are having us back a 3rd and a 4th time. There are students that have grown up with us and that’s really interesting to have that relationship with Native students pursuing a post-secondary education. It’s really special to keep writing music for them.